Today, I am paying a special tribute to my father, Dr. John F. Leeke, an entrepreneur, organizational development consultant, social justice activist, over 70 cyber-citizen, husband, and father. I call him “J” for short. J joined Facebook on the evening of January 20, 2009, the day President Barack H. Obama was sworn into his first term in office. Since 2009, J has used his digital presence on Facebook and Twitter to support President Obama. He has attended several D.C. social media events including the Blogalicious Weekend Conference in 2011. He also started live tweeting and Facebook posting while watching many of the political news programs on MSNBC and any late breaking news programs. 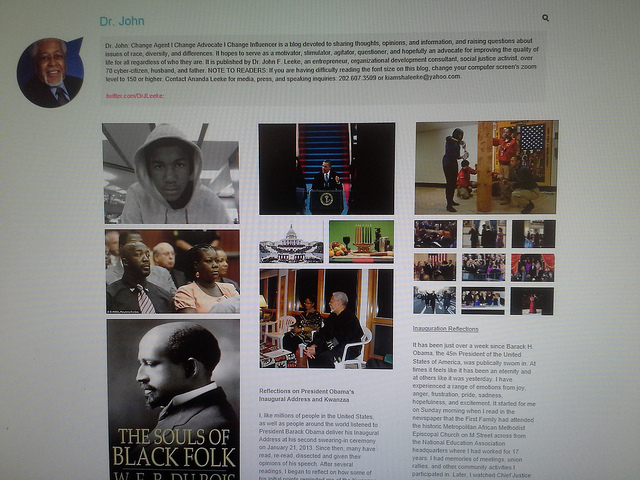 Last year, he launched his blog, Dr. John: Change Agent l Change Advocate l Change Influencer. 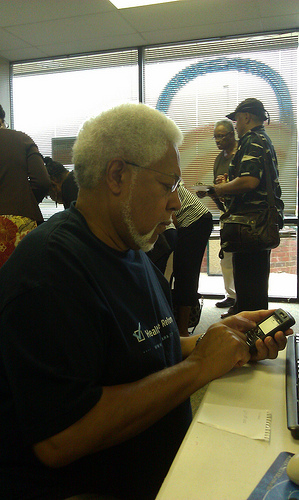 Initially, his blog was dedicated to supporting President Obama’s re-election campaign. Earlier this year, he decided to devote his blog to sharing thoughts, opinions, and information, and raising questions about issues of race, diversity, and differences. As a cyber-citizen blogger, “J” hopes to serve as a motivator, stimulator, agitator, questioner, and hopefully an advocate for improving the quality of life for all regardless of who they are. One of his most recent blog posts discussed the Trayvon Martin case. Click here to read it. This week, he wrote a blog post that offers tips on how to have discussions about race in your local community. I encourage you to check it out. J knows what he’s talking about (yeah I am bit biased …. he’s my father, but he is the real deal when it comes to race and diversity work)! Are your parents active online? What tools do they use the most?